The CappAero Multi guarantees single channel accuracy and precision across all channels due to the special design and construction of the Capp piston assembly. 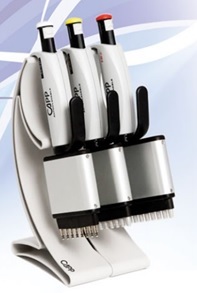 The incredibly robust and fully autoclavable pipette body offers easy maintenance while the unique Capp design with individually replaceable tip bases reduces the cost of what were once inevitable repairs. This smart and highly ergonomic pipette is built to last. - Easy and light tip mounting & ejection. - Unique design considerably reduces the thumb workload. - Ejection is simply a matter of applying light pressure to the levered ejector arm. - One of the lightest pipettes on the market and produce a consistent and reliable liquid transfer result in one ergonomic solution. - Available in 8-Channel or 12-Channel format.